I went on another website and it said that he would whip kids a 100 times if they didn’t listen to him! Child abuse right there! your mother is a cool lady!!! how about that? did columbus come with the spaniards? does that mean he and his “crew” were of the few to actually treat the native americans fairly? You say he treated them fairly? Do you call genocide fair?… I hope your kidding! Be may not believe it, but Christopher Columbus was a crackhead! What they don’t tell you is that he did drugs and he and his crew raped the indian women! He was a pompus jerk! Columbus’ fair trades and gifts were a perfect mask for his ultierior motives of enslaving the natives. What a snake! Hey scoop “Cristofero” isn’t the name for Christopher Columbus. It’s Cristofero in Italian or Cristobal in spanish. Christopher’s name meaning is “carrier of Christ” from the legend of St. Christopher. That’s horrible of the Europeans to just waltz right in and impose their religion and culture on a whole society. Just because the Native Americans were less advanced didn’t mean they didn’t have their own beliefs. The Native Americans were so naive and kind to the Europeans, or so this article makes it seem. Yet the Spaniards saw a chance to make more money, and pushed a whole defenseless civilization aside. If there’s one things this taught me, it was that people can be so selfish. SERIOUSLY!! in my school we are doing a trial of columbus, and I am on the prosecution side! WOW! columbus is an idiot. Thinking he could just walk up to a native american and just take the person as a slave. will he like it if we do that?!?! 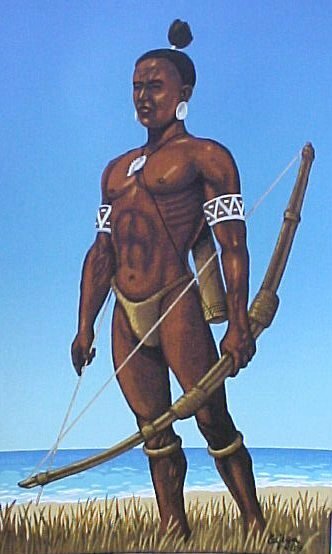 hello this dude is indirectly responsible for the genocide of the tainos……..and if he’s sooooo cool why didnt he try to stop the members of his fleet from treating them so harshly……..he was not unaware of the things that were going on where the tainos were concerned………columbus WAS NO HUMANITARIAN!!!! yea, i agree he was an idiot. but here’s the newsflash: it happened over 500 years ago and he’s dead now. Saying the stuff you guys say isn’t gonna change anything so get over it!! It’s so funny how everyone says Columbus discovered America when he gets here and he meets all these American Indians. So a: They discovered America, and b: Columbus didn’t even know he was on new land! He thought he was in india! I don’t even know why there’s a Columbus day. Christopher columbus was a idiotic, backstabbing, abusive jerk! So which one is it. This man lands in the islands od the caribbean, touches the mainland in South America. Touches Central America, but never lands on the main land of North America. Right? So his biggest fans celebrate him but to this day refuse to see as americans the people from the very territories he landed on. See what I mean?